National Youth Service Corps members attending the 2018 Batch B orientation course at the Nsit Atai Orientation Camp in Akwa Ibom State today displayed electrifying sporting skills at the camp's inter-platoon sports competitions. 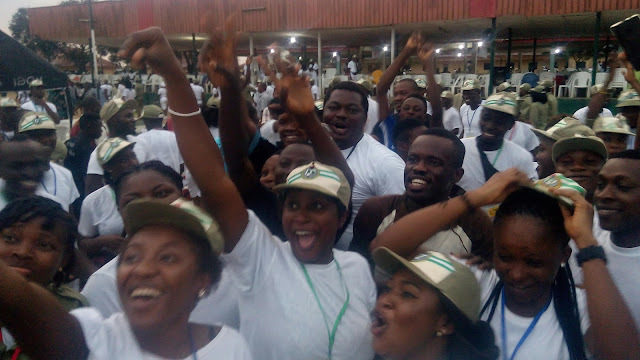 The sports competitions which commenced today were part of the camp's social activities designed to enable corps members unwind after series of strenuous military drills and lectures. At the start of the competitions, Platoon 1 defeated Platoon 10 at the football encounter, 5:4 in a penalty shootout. The match which ended goalless, regular time saw the two teams maintaining stiff defenses with sustained attacks throughout 90mins of play. During the penalty shootout, the two teams maintained parallel scores until a last kick by a Platoon 10 player was punched off the bar by the Platoon 1 goalkeeper. In the volleyball section, Platoon 6 beat Platoon-2 26:14 to emerge winner. The games are expected to continue with different teams taking the pitches.